The science behind this part of organization analytics started growing a few years ago. It is a very young part of analytics, and that is why there are lot of problems with naming it. Even if some differences can be found, there is nothing wrong with treating the following names as synonyms: People Analytics, Workforce Analytics, HR Analytics, HR insights and a lot more. People analytics is a data-driven approach to managing people at work and analytics, applied to ‘people issues’ – hiring, performance management, compensation, retention, etc. People Analytics is also well-described in Mike West’s article, which the figure 1 idea came from. 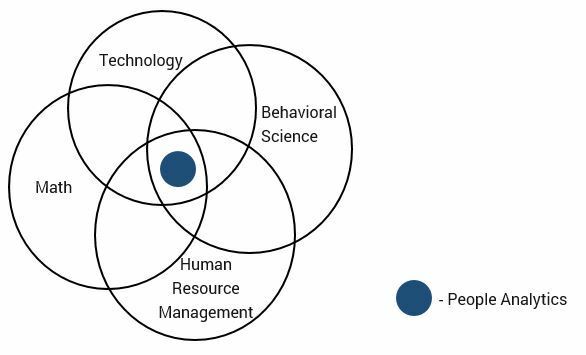 He (correctly) perceives People Analytics as something connecting HR management, math, technology and behavioral science. Figure 1. What is People Analytics? They see Workforce Analytics as a term in which encompasses people, robotics and other factors of the workforce. 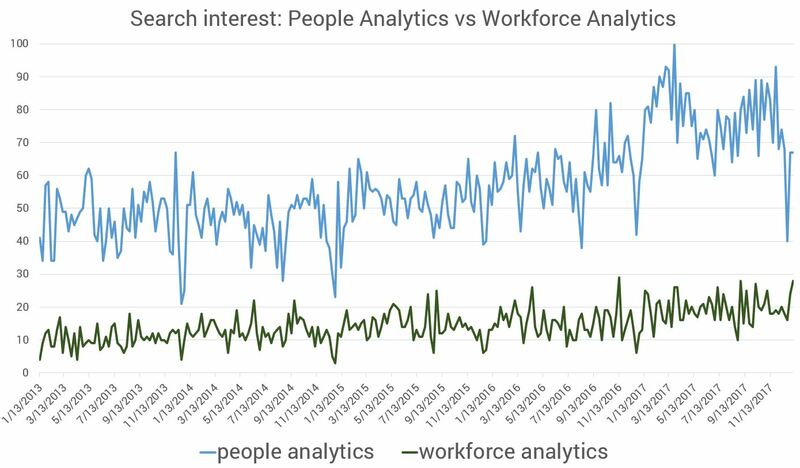 There may be some difference between the quoted definitions but both People Analytics and Workforce analytics are mostly used interchangeably. However, as can be seen on figure 2, the more popular name is definitely ‘People Analysis’. This data comes from Google search trends from the last 5 years. People Analytics became especially popular in 2017. If we had to predict which name will win this race, it is clear that there is an upward trend toward ‘People Analytics’ - maybe because it’s more human-related. And if that’s the main direction this science is moving in – we are in favor.